When I'm on a secret mission in the more remote parts of Afghanistan, I'll get up at 7am or earlier. I'll have just black tea - no sugar, it's very expensive here. 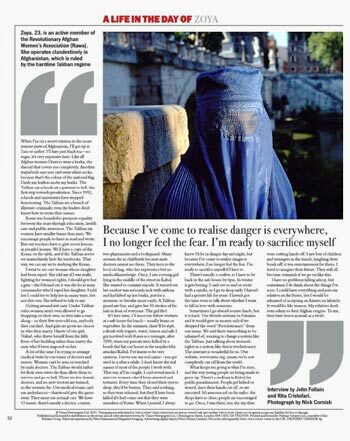 Like all Afghan women I have to wear a burka, the shroud that covers you completely. Another stupid rule says you can't wear white socks, because that's the colour of the national flag. I hide my leaflets under my burka. The Taliban say schools are a gateway to hell, the first step towards prostitution. Since 1992, schools and universities have stopped functioning. The Taliban are a bunch of illiterate criminals; even the leaders don't know how to write their names. RAWA was founded to promote equality between the sexes through education, health care and public awareness. The Taliban say women have smaller brains than men. We encourage people to learn to read and write. But our teachers have to give secret lessons in people's homes. We'll have a copy of the Koran on the table, and if the Taliban arrive we immediately hide the textbooks. That way, we can say we're studying the Koran. I went to see one woman whose daughter had been raped. She told me if I was really fighting for women's rights, I should give her a gun - she'd found out it was the local army commander who'd raped her daughter. I told her I could try to help her in many ways, but not that way. She refused to talk to me. Getting around isn't easy. Under Taliban rules,women aren't even allowed to go shopping on their own, so they take a man along - or their five-year-old son, anybody they can find. And girls are given no choice in who they marry. I know of one girl, Nahid, who threw herself from the fifth floor of her building rather than marry the man who'd been imposed on her. A lot of the time I'm trying to arrange medical visits by our teams of doctors and nurses. Women can't be seen or touched by male doctors. The Taliban would rather let their own wives die than allow them to survive and go to hell. There are few female doctors, and no new doctors are trained, so the women die. Our medical teams can't use ambulances - that would give the game away. They must use normal cars. We have 13 teams: there's usually a doctor, a nurse, two pharmacists and a bodyguard. Many women die in childbirth because male doctors cannot see them. They turn to the local old hag, who has experience but no medical knowledge. Once, I saw a young girl lying in the middle of the street in Kabul. She wanted to commit suicide. It turned out her mother was seriously sick with asthma and had lifted up her burka, just for a moment, to breathe more easily. A Taliban guard saw her, and gave her 50 strokes of the lash in front of everyone. The girl fled. If I have time, I'll meet my fellow workers at a safe house for lunch - usually beans or vegetables. In the summer, there'll be dogh, a drink with yogurt, water, lemon and salt. I got involved with RAWA as a teenager, after 1990, when my parents were killed by a bomb that hit our house as the mujaheddin attacked Kabul. I've learnt to be very cautious. I never use my real name - you get used to it after a while. I don't know the real names of most of the people I work with. That way, if I'm caught, I can't reveal much. I met two women who'd been arrested and tortured. Every time they closed their eyes to sleep, they'd be beaten. They said nothing, so they were released, but they'd have been killed if it had come out that they were members of RAWA. When I joined, I always knew I'd be in danger day and night, but because I've come to realise danger is everywhere, I no longer feel the fear. I'm ready to sacrifice myself if I have to. There's usually a curfew, so I have to be back in the safe house by 6pm. In winter it gets boring. I can't see to read or write with a candle, so I go to sleep early. I haven't had a private life for years. I haven't got the time even to talk about whether I want to fall in love with someone. Sometimes I go abroad to raise funds, but it is hard. The British embassy in Pakistan said it would give us money only if we dropped the word 'Revolutionary' from our name. We said there was nothing to be ashamed of, wanting to change a system like the Taliban. Just talking about women's rights in a system like that is revolutionary. The internet is wonderful for us. Our website, www.rawa.org, means we're not completely cut off from the world. What keeps me going is what I've seen, and the way young people are being made to grow up. There's a stadium in Kabul for public punishments. People get lashed or stoned, have their hands cut off, or are executed. It's announced on the radio: the shops have to close, people are encouraged to go. Once, I was there, too, the day they were cutting hands off. I saw lots of children and teenagers in the stands, laughing their heads off; it was entertainment for them. I tried to imagine their future. They will all become criminals if we go on like this. I have no problems falling asleep, but sometimes I do think about the things I've seen. I could leave everything and join my relatives in the States, but I would be ashamed of accepting an American lifestyle. It would be like treason. My relatives don't even admit to their Afghan origins. To me, they have hearts as small as a bird's. Interview by John Follain and Rita Cristofari.